Have you ever wondered what Microsoft Azure services were available in what regions? Well Microsoft has a webpage showing what services are available in what regions. I highly recommend reviewing the chart as some services are not in all regions. An simple example of this is not all VM instances are available in all regions. It’s good to know this BEFORE you start designing and building Azure resources. Either the upgrade to the latest version of WordPress solved my issue or whatever was causing spikes in CPU time and traffic stopped. There my upgraded there hasn’t been any spikes. I knew my personal site was low traffic so those spikes were odd. My personal website is hosted on Microsoft Azure as a shared web hosting plan using WordPress. Since my WordPress database is over 20MB I do pay $9.99 a month for a larger DB through ClearDB. Yesterday I went to post a blog to both Catapult’s website and my personal website. When I attempted to post it to my personal website I received a 402 error in Windows Live Writer. When I browsed to my personal website the page said it was temporary unavailable and to check back soon. I’m sorry that I didn’t get a screenshot. I wasn’t planning on blogging about this. 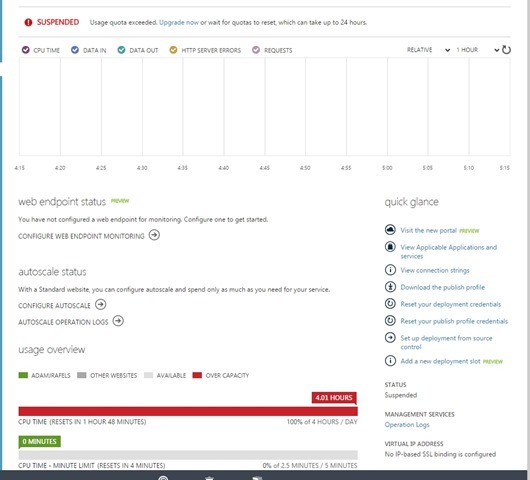 Knowing something wasn’t right I logged into Azure to manage my website and I noticed it was was suspended for excessive CPU cycles. I guess your only allowed 4 hours of CPU time every 24 hours. There are also quotas but since my personal website isn’t visited much I didn’t understand why I was hitting any quotas. I’ve never had this problem in the past and if I have I didn’t know about it. Sure enough everything eventually went back to normal but it looks like there are spikes every few days that might be suspending my account. Since then I updated WordPress to version 4 and I’m going to monitor everything. Hopefully that fixes this problem. If it doesn’t I need to look at other things. I could upgrade to a dedicated VM or add support but my personal website isn’t worth $30-$50 a month. Posted on November 19, 2014 Categories Microsoft AzureLeave a comment on My Microsoft Shared Web Hosting Plan was Suspended! Posted on November 15, 2014 Categories Microsoft AzureLeave a comment on My Microsoft Shared Web Hosting Plan was Suspended! Ever wonder what Microsoft server software is supported on Azure virtual machines? Bookmark the link below so that you can tell what Microsoft server software is supported on Azure virtual machines. It’s a living webpage. Posted on October 7, 2014 Categories Microsoft AzureLeave a comment on Ever wonder what Microsoft server software is supported on Azure virtual machines? “Microsoft Azure will be available for partners to resell in the open licensing programs on August 1st of this year(2014)”. This is great news as can be one less bill for companies to pay that are looking for a partner to implement and then manage certain aspects of IT. It also combines the consulting and service fees in setting up a solution with ongoing costs. I see this as a way for partners to keep a long term open relationship with a client.